We are an Alaska Department of Commerce & Economic Development approved continuing education provider. You can find us on the Alaska Course/Sponsor Search as '1 ATTEMPT (ATYOURPACEONLINE)' Sponsor #CON757. Choose At Your Pace Online with confidence knowing that you will get the education you need, backed up by our world class support if you have any questions. Whether you simply need to renew your AK contractor license or are looking to obtain your residential contractor endorsement, we have the online education you need. 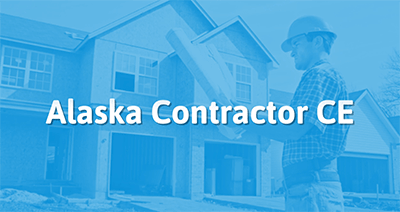 In the state of Alaska, you are required to obtain a Residential Contractor Endorsement in addition to a General Contractors license before submitting a bid or performing construction or alteration of a privately-owned residential structure. After obtaining your Residential Endorsement you will need to maintain it by taking continuing education every two years (see our CE courses below). Complete and Pass our Residential Contractor Endorsement online course. Send your signed and notarized residential contractor application, the application fee, and a copy of your official PSI contractor exam results to the state. Every 2 years, prior to December 31st of even-numbered years, you will need to take 16 credit hours of continuing education. After completing your 16 hours of continuing education you will be issued a certificate for your records. Complete your renewal online on the Alaska Department of Commerce's website to renew. This 16 hour is approved by the Alaska Contractor Licensing Section to provide the training for Alaska Contractors who are looking to add the Residential Endorsement to their Alaska Contractors' license. This course meets the education requirement for obtaining the Residential Endorsement. After completion of this course, you will have instant access to your certificate! This 16 hour course will meet the Alaska contractor continuing education requirements for any contractor with a Residential Contractor Endorsement. The course is broken down into two 8 hour sections. One section will cover Technical Sections and the second will cover Business Topics. This 8 hour course will meet the Alaska contractor continuing education requirements for any contractor with a Residential Contractor Endorsement. The Construction Contractor Section has approved your renewal application for continuing education credit for the course listed below. Each approved course has been issued a specific number. Please refer to this number when making inquiries to the Division. All courses expire two years from the date of approval according to 12 AAC 21.660(d). Residential Endorsement Holders are required to have 16 hours of continuing education every two years in accordance with 12 AAC 21.650. To recertify a course please submit the same Continuing Education Course Approval Application found at the above link.